Offering you extreme durability, this Choice 18" x 1000' food service heavy-duty aluminum foil roll is designed for more intense kitchen applications! This heavy weight roll has a greater thickness than standard aluminum foil, allowing it to withstand much more wear and tear in the kitchen. Featuring a high level of puncture- and tear-resistance, this foil is great for covering and transporting stainless steel steam table pans and full-size foil steam table pans. You can also use this foil to line pans for baking, boiling, and roasting to catch drippings, allowing for quick and easy cleanup. Plus this foil is perfect for lining your oven or covering your grill grates to prevent sticking and burning! This is quality at its best, this foil is thick and stand up to high heat in ovens this is a must have in the kitchen. Very good quality aluminum foil for a fraction of the price of our local suppliers. I will not be purchasing from anywhere else in the future. Great heavy duty foil. Works very well For a lot of different needs. I wish they would ship it better though. I have gotten a beat up box before and didn’t like that it came damaged. We use this foil in our high volume establishment and it works great. It is thick and durable, and one roll lasts us for about 2 months. It's exactly as it says it is. It's thick enough for any application, and pliable enough to form to whatever you need. I wouldn't recommend this for home application because the packaging is large. Strong, Durable and price is just right! Have been using this product since we opened the store. Value is great vs. other name brand locations. this foil is very good buy and i plain to buy this product again. i have already told my family and friend about this foil and emailed them the web site. Our kitchen staff loves this foil. It is just as thick as any heavy duty foil from a food-service distributor. We made the switch and haven't looked back. Was really surprised at the high quality of this product. It comes in a 1000' roll- which weighs a ton! Great product for the price, extremely happy with our purchase and will be purchasing again! Very economical foil roll. It is indeed heavy duty. Very thick and strong. I absolutely love this foil. Works perfectly for my needs and will continue to purchase. This foil wrap quality is very good. It is cheaper than some famous foil wrap brand but the quality might be better. I would recommend. Excellent product! 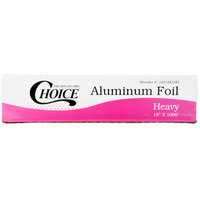 This Choice Heavy duty aluminum foil roll is great! It's huge and it'll last us forever. The foil itself is quality and super heavy duty. We use this to line some of our stainless steel and it works super well. This product works well for wrapping our subs. We keep it above the sub line and rip down the sheets for our larger 12 inch subs. Very minimum waste since you can pull or leave as much as the sub calls for. I really like this foil. It is thick enough that is does not rip, but thin enough that it is pliable and wraps around containers snugly. Wow! Such a low cost for a great quality. This foil is thick and stands up to the high heat of the ovens. Will buy again. I was originally skeptical buying this foil because of its super low price.. Boy was I surprised! It's much higher quality than anticipated and a great price! I will certainly be reordering it again and again! The foil was good and durable. When I got mine the foil was slightly dented on the end and it was hard to pull out without ruining it. The foil isn't very heavy duty. It tears easier than the heavy duty foil you can get at the grocery store. The foil cutter tore off on the first piece of foil I tried to cut. The other sizes from the same brand seem to do better. Great stuff. Heavy-duty is definitely the applicable term. Between the price and the quality of the foil itself, this is far and away the foil this business will be buying in the future. In fact, I bought six. This foil, is exactly what it says! It's definitely heavy duty! Stands up to heat in the oven as well as the cold in the freezer. Great price!! Great price for the product, slightly thinner than the name brand heavy duty foil but still works great for wrapping subs. Good value product as always Webstaurant! I use this heavy duty foil for everything! I line my half sheet pans with it before baking and roasting—It really saves on clean up. It is also great for wrapping items you are going to freeze...It is a high quality product at a great price! product is exactly as described. I would recommend this product. I use this product to foil wrap anything that needs to be foil wrapped. Quality is great and functions properly. I bought this after I was tired of running out of the small packs of aluminum foil sold in the supermarket. While this is not quite as thick/heavy as the Reynolds wrap brand heavy duty, it is plenty heavy duty for my cooking needs and there is enough here to last me a while. One thing worth noting is that this is quite heavy and may not be the easiest to maneuver around if you have to move it frequently. The Choice heavy duty foil is an essential part of our catering equipment. This foil is very good quality and the heavy-duty version is strong and holds up well. We use the foil to cover hotel pans and wrap sandwiches we are sending to-go. Choice 18" x 1000' Food Service Heavy-Duty Aluminum Foil Roll is so convenient for us. There are so many situations where 12 inch wide is simply not enough and regular weight doesn't do the job. With this there is no need to double up. Surprisingly good quality aluminum foil. I really was impressed with this stuff, especially since its significantly less expensive than my traditional vendor. It is something that you should consider. Watch your shipping because this product is heavy and can alter shipping prices unexpectedly. This aluminum foil is great to use for anything in the kitchen you want to keep fresh our hold in heat. We love the box it comes in and makes it easy to use with the nice cutting edge that is attached! This aluminum foil is a fantastic buy, it is indeed very heavy-duty and durable, it won't break. The price is great. It will last me for years to come. I think it is a good bridal shower gift from grandma. Huge savings compared to standard store brand heavy duty foil. Quality is top notch. Sturdy foil in a huge roll. Great for bbq wrapping. Super fast delivery too. The Choice heavy duty aluminum foil roll holds up to all task in our restaurant. This foil is thick and can be used for many of our cooking needs like backing potatoes or wrapping hot meatball or cheese steak subs. Great quality. We use a lot of foil. We usually get the heavy duty foil from a bulk store because it's good and thick. This foil I would call a medium duty foil. It's a good foil but not what I thought i was going to get. The price is great for the amount you get. This is one of those items that you have to try to see if it's right for you. We have been very happy with this foil. The price is so much lower in price than the price we were paying from our food supplier. Good Heavy Duty Foil at a good price!!! I would definitely order this product again. Cant beat the price for the quantity you are getting. I use a lot of foil in my kitchen, and I got tired of buying tiny rolls at the grocery store- I just keep running out of foil and right at the time when I need it the most. So I started looking for a solution that would work for me where I don't have to buy for a while and hopefully be more cost effective. This Choice 18" x 1000' was it. I bought it more than half a year ago and I am maybe half way through. The foil is thick enough being heavy-duty and can be used for pretty much anything, from backing potatoes to wrapping pork butts on the smoker and more. I love the quality and cost efficiency. Good Heavy Duty Foil at a good price!!! I would definitely order this product again if I was in a pinch and couldn't find something similar locally. This heavy-duty aluminum foil is great to have at the restaurant. It's a large roll that is easy to tear. Can't go wrong with it. Very heavy duty foil, at least twice as this as the normal foil. As a result it does not tear easily as most foil does. The dispenser is easy to use and the heaviness of the roll keeps the box in place. Foil is also easy to label with a marker. We love teh Heavy - Duty Food Service Aluminum Foil 18" x 1000. itis perfect for any of our need's,from covering food to help keep it warm.Wrapping take out orders. You can even use it on the grill.Very sturdy dosen't rip. This heavy duty foil is totally worth the extra money! It is expensive but it holds up to roasting in the oven and for reheating items!!! A little bit more expensive but definitely worth the extra money. I use this product at our steak house to wrap all the leftover products.